The busy company needed a UPS with hearty capacity, redundancy and efficiency to ensure travel operations remain up and running around the clock. 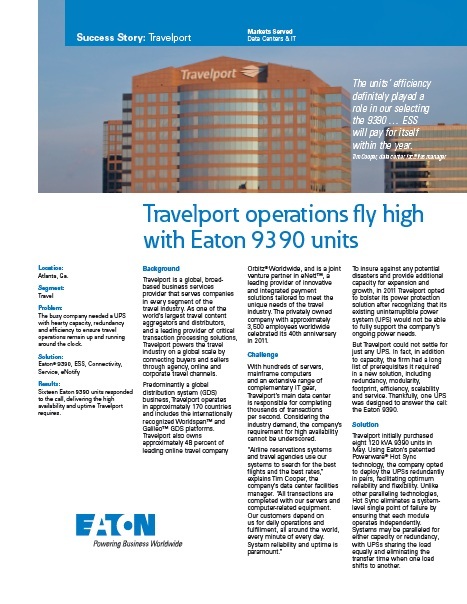 Sixteen Eaton 9390 units responded to the call, delivering the high availability and uptime Travelport requires. With hundreds of servers, mainframe computers and an extensive range of complementary IT gear, Travelport’s main data center is responsible for completing thousands of transactions per second. To insure against any potential disasters and provide additional capacity for expansion and growth, Travelport opted to bolster its power protection solution after recognizing that its existing UPS would not be able to fully support the company’s ongoing power needs. Thanks to the deployment of 16 120 kVA 9390 UPSs, there are no boundaries when it comes to Travelport’s continued business operations.